One hundred consecutive total hip replacements using a cementless Duraloc 300 cup were reviewed at a minimum of 15 years. All acetabular metal components were found to be stable with no evidence of loosening. 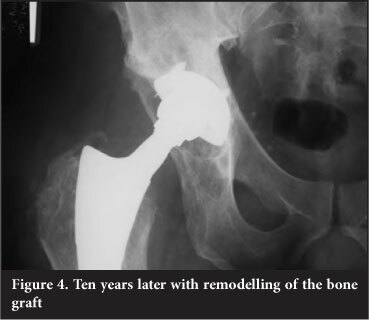 The purpose of this paper is to retrospectively review the ongoing radiological results of this cohort of consecutive total hip replacements. Between August 1991 and July 1993, we performed 100 consecutive total hip replacements in 93 patients (48 men and 45 women). Two experienced hip surgeons performed 93 operations and seven were undertaken by registrars under supervision. The surgery was performed via a modified anterior approach as previously described.1 The Duraloc 300, tri-spiked, Porocoat acetabular implants were used with a polyethylene liner containing a 10° long wall, that was gamma irradiated in air. Of the original 100 hips, 35 patients died (37 hips) at an average of seven years post surgery. None of these patients had undergone a re-operation and all had a satisfactory fixation of the acetabular cup as seen on radiographs taken on average 1.7 years before death. Six patients (seven hips) were lost to follow-up leaving 56 hips available for analysis after a minimum duration of follow-up of 15 years. At 15-year follow-up none of the acetabular implants showed any evidence of loosening. We defined loosening as cup migration or lucent lines of more than 1 mm diameter present in all three zones (as per Hodgkinson et al.2). The average wear at 15-year follow-up was 0.08 mm/y. This was less than the 0.12 mm/y at 10-year follow-up. Fourteen hips had granulomas at 15-year follow-up. Eleven of these granulomas were situated in zone 2, which may be related to the fact that a hole eliminator had not been used in these cups. Eleven patients required revision surgery. Two had well-fixed cups removed at the time of stem revision at another institution, one had the long wall repositioned for early dislocation, five had liner revision and underwent impaction bone grafting to granulomas, three had liner exchange for excessive wear without granuloma present. Four of these revisions took place in the last 5 years. 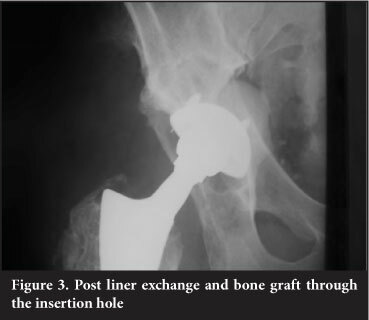 Three were liner revisions only (two for excessive wear, one during granuloma bone-grafting), while one had the liner changed during revision of a loose stem post periprosthetic fracture. In the five hips that were revised for granuloma around the cup, all showed good graft incorporation and remodelling. There were no complications related to the revision surgery. The zero radiological loosening rate of the Duraloc 300 cups at 15 years would indicate that spiked Porocoated cups provides sufficient bone in-growth for long-term stability even in cases with granuloma formation. 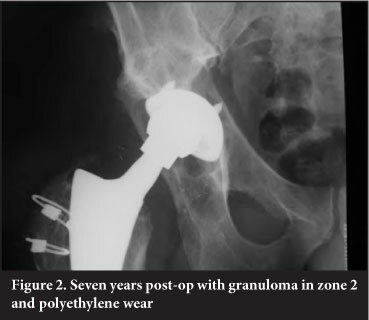 The predominance of zone 2 granuloma indicates that wear particles gained entry to the bony acetabulum via the apex hole for the cup introducer. Use of a hole eliminator would be prudent (Figures 1-4). The cases that required liner revision and bone grafting were easy to perform and in all cases graft material showed evidence of incorporation. 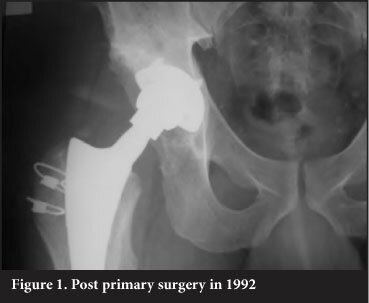 At 15 years all surviving patients had well-fixed, functioning acetabular components. Improvements in bearing surfaces may improve wear rates and granuloma formation in the future but fixation rates cannot be improved. If we solve the problem of wear, could joint replacement surgery offer a permanent solution?